This blog has information about the lighthouse's located in the state of Alabama , more exactly the Mobile Bay and U.S. Gulf Coast areas. Devon Walsh, News anchor for WKRG TV 5 interviewed Pat Edwards, a member of the Dauphin Island lighthouse committee and Warren Lee, a member of the Alabama lighthouse Association today January 12, 2009 at 9:00AM. The interview was done near Fort Morgan on Dauphin Island, Alabama. Devon braved the freezing cold temperatures and strong north winds to get the story for you! The TV news story will be about the new USPS Sand Island Lighthouse Stamp. Stay tuned to Channel five to see it. It should air sometime over the next couple of weeks! They may have a surprise scoop about something new for the public when they air the story. A new postage stamp has been created using the Sand Island Lighthouse. Warren Lee worked as a consultant with USPS employees to help develop the stamp. Slated for release this summer. Warren hopes the publicity of the stamp will increase awareness of the plight they are having attempting to raise the funds to save this great lighthouse. volunteers have been working for years trying to save this great majestic historical building and turn it into a educational, recreational site. Open to the public. The lighthouse volunteers have been able to raise only a small portion of the needed funds so far. They are spending the funds on the things that are immediatly needed to keep the tower standing as they become available. 100% of the money raised by us is used on the lighthouse. All of the administrative duties and oversight is being done by volunteers. Many of the volunteers pay for needed items out of their own pockets right now. A testimate to the dedication of the people associated with this project. We have over two hundred members and volunteers involved in the project and our membership still continues to grow. The political and popular support is also growing and we believe that it will be possible to raise the several million dollars that are needed to complete this project. 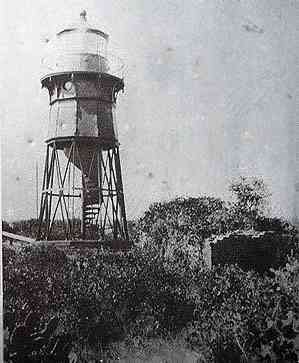 However we are working against the inevitable time that a hurricane will strike the lighthouse. it is possible that it will destroy the lighthouse before we are able to raise enough funding to pay for enough repair work to be done to the tower restoring it to a level where it can once again take the pounding of hurricanes. The Town of Dauphin island legally owns it, but the lighthouse really belongs to all of the citizens of the United States and we hope that thousands get the chance to visit, stay and enjoy the tranquility and magic that is the Sand Island lighthouse one day soon. Help Save this Lighthouse purchase a Book! An honored tradition-Mobile Bar Pilot click image to learn more about them! Looks like R2 D2! Is Tridex a robot?